So the camera has been out for a year, but this was our first outing with the small box with a lens mount. I can say that I was more impressed with the camera than I thought I would be. Why is that? As many have noted the camera has many shortcomings but comes in at a price tag that may have you overlooking them. The recording and file types of the camera are amazing at any price. Recording straight to ProRes will cost you at least another grand coming off your Sony/Canon/Nikon and you have to attach that gizmo to your rig. The BMCC does it in camera. If you want raw, you can record to Cinema DNG files. Be prepared to spend some time with Resolve or some other workflow to get your RAW footage into your NLE. It was really easy to use and intuitive. An inexpensive camera should not be complicated. Some of the features like focus assist were very useful. We used the Canon EF model with a variety of lenses. The Tokina 11-16 worked great as did the Rokinon Cine primes. One of the Canon EF lens had trouble with the iris control. 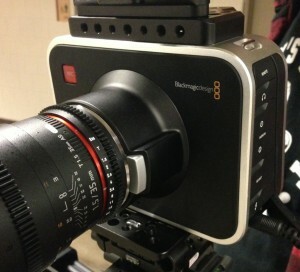 It worked fine on a DSLR, just couldn’t communicate with the BMCC. The shortcomings have been well documented and some are just compromises of an inexpensive motion picture camera. Not every camera can or should do everything. If it does it should cost more than $2K. The first thing my students asked was how fast does it shoot? 60 fps? nope. You got 24 or 30. Okay, I can still make a movie with that. Card format and clip editing in camera. nope. You have to connect your SSD card to a computer to format it and manage any clips. The battery is internal. What? By the time we had the shot set up and dolly shot rehearsed the battery was flashing 25%. More cable wrangling or a third party solution to power. Can I plug a mic in? Sure with an adaptor to 1/4″ plugs. But I don’t hear any sound. That’s because there is no Phantom power and we have a 416 p48 plugged in. I’m sure there were other minor issues but none that stand out. If you are aware of the compromises you can use this camera to make some great images. If you were expecting a RED EPIC for $2K you will be disappointed.